'A lot of red flags' may have been missed in the background of the Washington Navy Yard shooter, the defense secretary says. WASHINGTON — Defense Secretary Chuck Hagel has ordered two sweeping reviews of military security and employee screening programs, acknowledging Wednesday that “a lot of red flags” may have been missed in the background of the Washington Navy Yard shooter. Two days after former Navy reservist Aaron Alexis gunned down 12 people in a shooting rampage inside the Navy base, Pentagon leaders struggled with whether a string of minor arrests, mental health issues and other behavioral problems should have been enough to strip him of his security clearance or deny him access to the secure facility in southeast Washington. Navy Secretary Ray Mabus, meanwhile, announced Wednesday night that he wants three rapid reviews completed by Oct. 1, including whether a contracting company should inform the Navy if it decides to review a worker’s security clearance. That order raises questions about whether the company that employed Alexis, the Florida-based IT consulting firm The Experts, had decided to review his clearance. A security clearance often is critical for contractors working in defense jobs. Law enforcement officials have said they don’t yet have a motive for Alexis’ shooting rampage. Mabus also ordered a review of Alexis’ service record to determine whether his conduct problems while in the Navy should have threatened his ability to keep his security clearance. And the secretary asked for a broader look at what types of behavior should trigger a re-evaluation of a person’s clearance. The reviews underscore widespread concerns that there are gaps in the current procedures for screening workers, particularly for conduct or mental health problems and other changes that occur over time. 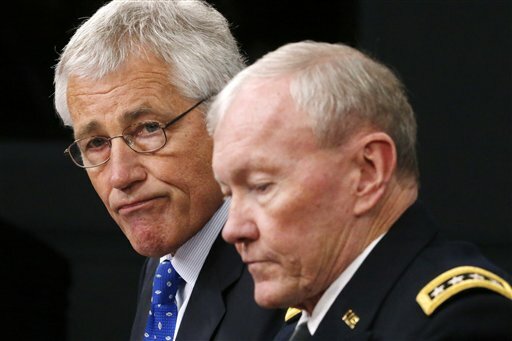 But Gen. Martin Dempsey, chairman of the Joint Chiefs of Staff, said he still believes that those who have served in the military should not be stigmatized by having to answer questions about their mental health status on security clearance forms. In recent years, Dempsey and other military leaders had argued that service members — many of whom have been plagued by stress disorders and other problems after multiple deployments in more than a decade of war — should have the opportunity to overcome their mental health challenges without being stigmatized. He questioned whether forcing Alexis to disclose that he had been undergoing mental health treatments could have prevented Monday’s tragedy. As officials worked to untangle the events surrounding the shooting spree and what may have triggered or enabled it, they continued Wednesday to say that routine security procedures were followed when Alexis used his authorized access card to get onto the base and into Building 197. They said his checkered Navy career, marred by unauthorized absences and other misconduct, as well as two brushes with the law in Georgia and Texas, were probably not enough to prompt a review of his “secret” level security clearance or prevent him from using that clearance to go onto the base and do his job as an information technology contractor. A “secret” clearance is held by nearly 4 million people, the government’s lowest classified clearance. Although he had been arrested he was never convicted of any crime. And the fact that he was undergoing mental health treatment also would not affect his status, nor did the most recent incident in Rhode Island when he told police that he could hear voices talking to him through the walls and ceilings of his hotel room. Navy officials said the Newport, R.I., police reported the incident to officers at the base security office, but nothing more was done about it because he did not appear to be a threat to himself or anyone else at the time. The Veterans Affairs Department has told lawmakers that Alexis visited two VA hospitals in late August complaining of insomnia, but that he denied struggling with anxiety or depression or had thoughts of harming himself or others. Defense officials described a balancing act in which the military tries to collect enough information about individuals to provide security, but not enough to sacrifice workers’ privacy or personal health records. The officials said that it takes a “derogatory” incident to trigger review or revocation of someone’s security clearance or access card. And they acknowledged that the standard is deliberately vague so that it can allow for individual circumstances. The officials spoke on condition of anonymity because they were not authorized to discuss the security process publicly by name. Alexis had received his secret level security clearance when he was a Navy reservist in 2008, and that status is valid for 10 years. On Capitol Hill, Adm. Jonathan Greenert, chief of naval operations, told lawmakers that cost issues, including the latest budget crisis, did not affect the base’s security. At the Pentagon, Hagel said that while “we don’t live in a risk-free society,” employees deserve a safe and secure work environment. And, he said, “obviously, something went wrong” on Monday. He said he has ordered the Pentagon to review the physical security and access procedures at all U.S. defense facilities worldwide as well as a study of the programs used for granting and renewing the security clearances for the military, civilian employees and contractors.